Explain about import registration process, cargo movement to Oman from overseas countries, Import delivery process in Oman etc. How to import to Oman? What are the import procedures in Oman to move goods? Detail the import methodology in Oman. 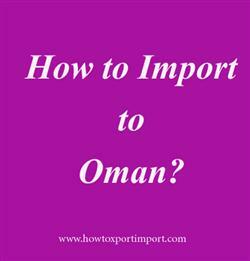 This post explains about step by step procedures that need to be finished with Oman government authority for importation to Oman. Any legal entity who has registered with Tax Authority of Oman can start appropriate business and engage with international trade by fulfilling necessary requirements by the Government of Oman. For commercial purpose, a registered trade with concerned license (if required) as per the business and have enlisted in the Trade and Company Register of the country is must for exporting and importing of goods from and into Oman. The Royal Oman Police Customs Directorate (ROP Customs) are customs authority who works for bringing legitimate, safe, fair and smooth international trade in Oman. They aims at achieving the economic security of Sultanate of Oman, execution of all the decrees issued by the country’s ministries and governmental institutions which concerned and facilitating genuine trade. The electronic system “Bayan” target to support the commercial society through the facilitation and the flow of the movement of goods, whether coming to Oman or leaving, decrease the cost of import and export processes, enhance the partnership between customs and other segments in the commercial society, encouraging the local and foreign investment and capital attraction. This post explains about different phases in import process that every importer needs to go through in Oman. How to import to MUSCAT? Formalities for import to SALALAH. Procedures to import to MUSCAT. Need to import to SALALAH. Mandatory process need to complete import in SALALAH. First permission required to import in MUSCAT. How can I clear customs to import in MUSCAT. What Customs formalities required to import in SALALAH. Documentation procedures for import at MUSCAT customs. Guidelines to import to MUSCAT Please guide to import to SALALAH. Help to import to. Procedures required to import to MUSCAT. What are the documents need to be submitted to import at SALALAH port customs. Which documents should I provide at MUSCAT customs port location for import. What should I do to import to MUSCAT. Zainul Abid: On 16 November 2018 have any restriction for importing used machinery to Muscat ?